Keep the coming weekend, 19 and 20 September 2015, free for the event of the year: the St Ives Medieval Faire. Last year the Fair, the first time it was held, was a huge success and this year promises to be even better. The trebuchet will be firing again, the birds of preys will show what they can do and much, much more is being planned. I expect the highlight to be Jousting Tournament, where knights in shining armour on magnificent horses display their skills. And for those who wish to venture outside of the medieval period, the Routiers will present a Pike and Musket Drill. Bring the kids, who will enjoy an extensive offer of medievally themed entertainments. It really is a great day for families to experience the past in real time. The Jousting Tournament is very real and spectacular action, beating any video game of today. After all the excitement and a walk through the Medieval Village you might feel thirsty. The Tavern caters for the adult thirst. What about a 4 Pines “Sir Andrews Gruit” or maybe a “Mad Monks Mead’? Of course attending all the attractions of the St Ives Medieval Faire is exhausting, so for the first time on Saturday evening there will be a feast as a unique opportunity to enjoy a full dining experience of medieval food and entertainment into the evening. While sometimes in Australia, these medieval events can be rather kitsch, this one stands out for offering a real inight into the middle ages. Looking at the Medieval Village, visitors can understand how people lived then. And the displays of various aspects of warfare and jousting show the grimmer side of the times. For the full programme and to order your tickets, go to http://stivesmedievalfaire.com.au/. Last weekend, 20/21 September 2014, the Inaugural St Ives Medieval Faire took place in what the organisers named the Kingdom of St Ives (at less feudal times known as the St Ives Showground) on Sydney’s North Shore. The Showground was the perfect setting for this event. The day started with a Grand Parade in the Jousting Arena, in which all participants took part. During the two days, visitors had the opportunity to enjoy a wide variety of displays to get into a medieval mood. For those interesting in browsing and shopping (and be honest, who isn’t?) the stalls, offering mainly items inspired by the middle ages, were a must. This was in some instances combined with a display of medieval techniques, like wood turning or blacksmithing. The 15th century encampment was the home of various retinues. Here, a lady of one the groups explained how bread was baked in a medieval oven – I can now understand why bakeries were such a fire hazard. However, the main attraction were the display of medieval prowess in various arms. Whether it was combat like in the Viking wars, or the archery display (visitors also had the opportunity to try out their own skills) or the firing of the trebuchet. As it shot watermelons, it probably kept the local birds happy and well fed. Talking about birds, we should not forget the birds of prey. They performed at 1.30 pm, but could at other times be admired from a closer distance. For me the main attraction were the jousting sessions, with knights in full armour on their magnificent horses. The jousts were presided over by the King and Queen of St Ives with their lords and ladies. The crème de la crème of the world’s jousting knights took part in the sessions and it was easy to feel transported back to medieval times. It was a marvellous day and it is to be hoped that the St Ives Medieval Faire will become a fixture in the North Shore calendar. This essay was written by Rachel during the course of her studies towards a Master’s degree at the University of New England. Were contraceptives and other means of family limitation such as abortion, infanticide, and child abandonment practised in medieval Western Europe? If so, what remedies and methods of contraception were used, to what extent, and were they successful? Early research into the topic concluded that contraception was virtually unknown in the Middle Ages and that medieval people did not have a ‘contraceptive mentality’. However, more recent investigations have produced a plethora of writing which clearly demonstrates that medieval society not only knew about various forms of contraception and abortifacients; they used them to such a degree that medical texts, church doctrine and the common literature of the time are strewn with references to their use. Documents are littered with contraceptive recipes and methods and contain warnings and prohibitions against certain herbs, many of these originating in antiquity. Contemporary research into the history of human fertility control has therefore ceased to ask when contraception became common place and effective, and instead questions how family limitation was practised prior to the eighteenth century. The idea and practice of controlling the number of children conceived and born has been employed across all cultures through time, although the methods and efficacy vary. The last meeting of the year of the New South Wales Branch of the Richard III Society was held on Saturday, 14 December 2013, the last meeting held at the Harry Jensen Centre. As of February 2014 we will once again, by popular demand, be meeting at the Sydney Mechanics’ School of Arts at 280 Pitt Street, in the central CBD. The meeting was opened with remarks made by our Chair Judith with a warm welcome extended to the several new members and visitors present, one of whom, Joseph, came all the way from Armidale to attend! Treasurer Judy was away, but had given Judith her report and assured us of the good financial status of the Branch. Dorothea reported on the very lively branch website that has many international visitors, and can always use more contributions from members. Congratulations had been sent by Dorothea on behalf of the Branch to Sally Henshaw for winning the 2013 Robert Hamblin Award for work of outstanding service to the Richard III Society. Our branch is grateful to Sally for keeping us up to date with eye witness reports during the Greyfriars Dig in 2012. Sally had thanked the NSW Branch and wished all its members a happy Christmas. Lynne reported on Sales, and her success in obtaining new supplies and showed the attractive red pens, which had been introduced for the Australasian Convention and replace the prior style. The Branch Secretary had nothing to report and Angela was unable to attend. The Branch wishes Angela a full recovery, and hopes to see her at meetings again in the New Year. The 2013 volume of our branch journal, The Chronicles of the White Rose, was distributed to all attending. Our featured speaker was our own member Lynne, who presented a fascinating program illustrated with slides, about exquisite, intricate medieval jewellery of which she clearly knew a great deal and enjoyed sharing her enthusiasm with the branch. We hope to be able to share her talk here in the near future. Following the raffle, which had exceptionally nice prizes this month, we had the challenge of a delightful quiz sent by our erstwhile secretary Julia who has recently retired to the coast north of Newcastle, but is still contributing to the fun we always have at the holiday meeting. The quiz had retitled popular and traditional Christmas hymns and carols, which had to be identified by players by the correct name. Our visitor Bruce, who will also be our February speaker, scored 14 out of 15, thereby amazing the rest of us whilst winning a lovely prize. Runners up also received prizes. We enjoyed the mental challenge, and thanked Julia in absentia for such a clever activity. A lovely afternoon tea was then held with special offerings from members’ kitchens, the last to be presented by our tea-lady Rosemary who has been involved for many years helping to make our meetings enjoyable. As of next year Joan will be taking over the role, with Moya as backup. Our next gathering will be on 8 February 2014 when our guest speaker will be Bruce speaking on the topic of the Angevin Kings and Queens. Don’t forget to go to the Sydney Mechanics’ School of Arts next year! A reminder for our next general meeting on Saturday, 8 June, at 2pm. The speaker will be Ben Cross, talking to us about ‘Medieval Thought and Philosophy’. We are so grateful to Ben for finding time for us – he has been frantically busy recently and is shortly to leave for Oxford to complete his PhD thesis on this subject. However, as we all know, it is those who are the busiest who find the time to fit in something extra. At every June meeting, we like to make a point of marking the anniversary of the birth of Richard III’s queen, Anne Neville, on 11 June 1456. This means there will be something special to enjoy at our afternoon tea. Obviously this is a meeting that can’t be missed. See you there! Some of you may have seen a – rather disappointing – article in The (British) Telegraph recently about research into Richard’s teeth. The author, Richard Gray, starts with the fanciful description that Richard was killed by blows which were so heavy that they “drove the king’s crown into his head”. However, Bob Woosnam-Savage explained at the conference in Leicester that Richard could only have suffered the injuries that killed him after his helmet had been removed and also explained by what kind of weapon. Mr Gray then states that Richard suffered from bruxism or teeth grinding. For him, this confirms Shakespeare’s portrayal of Richard as “anxious and fearful” and that the reason might be that “he was wracked with guilt over the fate of the Princes in the Tower, who he is accused of murdering to assume the throne”. Richard Gray based his article on research by Dr Amit Rai, a London dentist, which was published in the British Dental Journal. It is hardly surprising that Shakespearean flights of fancy are lacking in the original article. Dr Rai starts with some general information on dentistry in the middle ages. Dental treatment would have been carried out by skilled barbers or surgeons, though monks were the dentists of the time, but they were not allowed to shed blood. A professor of medicine and surgery at Bologna earlier in the 15th century, Giovanni de Arcoli, published guidelines of how to look after your teeth, some of which are still familiar to us, for instance that you should clean your teeth after eating, should avoid sweets or not break hard things with your teeth. To clean your teeth you should use a thin piece of wood “somewhat broad at the ends, but not sharp-pointed or edged”. Brushes with bristles were only introduced to Europe from China after Richard’s lifetime. Then Dr Rai looks in more details at Richard’s teeth. He does find indeed tooth surface loss, which might be the result of stress related bruxism, but thinks it is more likely that it was caused by dietary abrasions and erosion. He explains that this erosion is not severe, which indicates a more affluent member of medieval society, who would have eaten food made from more finely milled flour. This is also confirmed by the findings that the individual had eaten a diet rich in seafood – again something that would be expected of someone of a higher social status. Three teeth were missing, which Dr Rai attributes to caries. There are signs that the gaps where these teeth would have been have closed, indicating that they had been removed by a barber or surgeon earlier in Richard’s life. For Mr Gray this was the result of a diet “rich in carbohydrates and sugar”. Dr Rai, who had just explained that the teeth indicate a protein-rich diet, only mentions that caries would have been more likely in more affluent persons. Some teeth show mineralised deposits, which probably are a build up of tartar. As there is less of this on certain teeth than on others, it might indicate that Richard followed Giovanni de Arcoli’s guidelines on cleaning teeth, with a piece of wood, not a brush. The left central incisor was also missing, which Dr Rai thinks could have been knocked out when Richard was killed “by some of the most advanced military weapons of the time” – not his own crown. On the whole, Richard’s teeth give us a good idea of the dental hygiene people in those time would have used. The difference between the information published in a daily paper, with its sensationalist interpretations, and that in a peer reviewed scientific journal is striking. There is little doubt, which article is more reliable. The title says it all. The authentic recipes are given at the top of the page, but let’s give thanks to the late Maggie Black who has converted them to modern English for easy reading and adapted them for up-to date means of preparation and cooking. So there is no need to “first catch your hare”, as suggested by the redoubtable Mrs Beeton, before tackling “Civey of Hare”. In fact you may prefer to catch a couple of rabbits at the butcher instead if, like me, you have coped with a hare proudly brought back by ardent game shooters in the family. There is so much meat on a full grown hare – and delicious it is too – but using all of it is a challenge. Forget the struggle with variations on turkey and ham leftovers after Christmas;the hare wins paws down. Hare is also an ingredient of the “Grete Pye” which was a essential at Christmas time. Many other meats were involved, as well as spices and dried fruits. The version here would be fabulous for a large family gathering in cooler months, and the ideas for soups are delicious. Need a dessert? “Fig and raisin ‘crème’” is truly scrumptious thanks to the addition of wine and spices and can be used hot or cold. Add ice-cream as a bonus. To cleanse and make them white. Take the root of mallows and rub thy teeth and thy gums therewith. And after that take a rough cloth, and rub thy teeth therewith. If thou washest thy mouth once a month with water or with wine that titemall, that is spurge, is seethed in, the teeth shall never fall. Knotgrass kneaded and laid to the teeth is a good medicine. You don’t find this kind of advice in every cookbook, so relish the help and happiness this one offers. 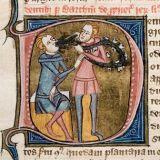 The illustrations of life in medieval times showing the enjoyment of great cooking are delightful. This is the title of an upcoming symposium at the University of Kent on ‘the role and representation of owners, donors and patrons in medieval art’. The programme sounds most interesting. There is a talk ‘“Mon seul desir”: Self-presentation in the patronage of John Talbot, 1st Earl of Shrewsbury’, who was the father of Eleanor Talbot, who is so instrumental in Richard III’s claim to the throne. And another one on ‘The Changing Image of Plantagenet Kingship: Hagiography and political iconography in the owner figures of St Stephen’s Chapel’. Once again we probably feel disappointed that we can’t simply go and attend an interesting event like this. However, in this case we have something to make up for it: The NSW Branch one day convention on the following Sunday in Mittagong! An event not to be missed. For more info on the symposium, click here. Barbara Gaskell Denvil was born in England, grew up amongst artists and authors and started writing at a young age. She published numerous short stories and articles, and worked as an editor, book critic and reader for publishers and television companies. About 10 years ago she began writing medieval novels (mystery, romance, murder-adventure) set principally in 15th century England. Her new novel Sumerford’s Autumn is also set during the last years of the 15th century and will make major reference to the fate of both King Edward IV’s sons. It will be published for Kindle later this month or early in April. Barbara also writes fantasy, though this tends to be more dark and adult. Her fantasy novel Fair Weather is set in medieval England around the early 1200s. There’s a fair chunk of historical content, but the basic plot is pure fantasy. It is also available for Amazon Kindle and from Smashwords in other formats. Barbara’s novels are gripping and engrossing stories, real page turners, involving believable characters to carry the story along, while maintaining a high level of historical accuracy. After reading Satin Cinnabar, we asked Barbara to tell us more about the medieval world she describes so masterfully in the novel. This is the second part of her article “Medieval Life”, part 1 and part 2 were on this site previously. Thank you, Barbara, for sharing this with us. Don’t forget to visit Barbara’s blog. However, not everything was risk and danger, and justice was far more readily available than many people now assume. There was no organised police force of course, but there were sheriffs, constables, judges, law courts, solicitors, lawyers, and a careful system of law and order. This was sometimes open to bribery and corruption (Richard III took pains to try and eliminate some of this corruption) but folk were not generally vulnerable to outright anarchy and destruction. It is sometimes thought, for instance, that while ‘usurping’ the throne by force, Richard III was backed by a marauding army and therefore simply intimidated everyone into supporting him. This is absurd. This sort of thing did not happen either in his case, or for anyone else by the 15th century. Sometimes in some rural backwater the local lord might achieve some fairly horrid results in this manner, but this sort of feudalism was no longer possible to maintain, and criminals were usually brought to justice. As a deterrent, execution was brutal. Nobility was beheaded, and that could take several strokes of a blunt axe wielded by a slovenly or even drunken executioner. Nobility was, however, often pardoned before the final act, depending on the crime. The common man was hanged, and if his crime was sufficiently heinous, especially if it involved treachery to the crown, he could be hung, drawn and quartered. He could also be cut down from the noose before dead, and publicly castrated. This had been accepted practise in previous eras, but by the mid to late 1400s this practise was dying out. Heretics could be burned, but NOT witches. Witches were not classed as heretics until the 17th century, and during medieval times witchcraft had no association with devil worship. Witches were often herbalists and midwives, wise women and astrologers. As long as they did not attempt to kill anyone or predict the king’s death – a crime punishable by execution – astrology was generally practised and in fact was an acceptable part of diagnosis and medicine. Public execution is often now depicted as a callous celebration and a good day out for the local citizens, but the public nature of the spectacle was originally designed as a deterrent, not a diversion. Good men dragged along their sons to show them what terrible consequences came from evil living. Women sobbed and hid their eyes. Men offered a last cup of beer to the unfortunate condemned. Those who had been wronged were able to see justice done, and relatives could say goodbye. Some no doubt enjoyed the drama, but this was not the general attitude. Prisons were appalling places and the conditions for the inmates were atrocious. However, torture was not used. It was entirely illegal in England until Tudor times. The Tower of London, now so closely associated with dungeons, torture and death, was simply a royal palace before the reign of Henry VII. It was used as luxury apartments, as a meeting chamber for the Royal Council, celebrations and feasting, as well as occasionally housing the rare important prisoner. The so called ‘princes in the Tower’ were not imprisoned. They were originally housed in the vast refurbished Royal Apartments while awaiting Edward V’s coronation, and even after this was cancelled, they were removed to other comfortable apartments. Those staying here had servants, access to the gardens and battlements, and could please themselves in many ways, sometimes even those who were denied the freedom to leave. There was even a zoo. Indeed, the Tower was busily occupied with a huge and bustling household. No damp silent stone, no dark secrets, no unlit and unused stairways, torture chambers or haunted corridors. Unfortunately the Tudor dynasty brought many changes. Under some circumstances the rack was subsequently used, and although special permission was supposed to be given for the use of torture, other methods of persuasion were no kinder. Confessions during the reigns of Henry VII, Henry VIII and the other Tudor monarchs were frequently obtained under torture and it is high time some of these confessions were seen as the useless and miserable lies they clearly were. During Henry VII’s monarchy the rising middle classes and the growing independence of women also took a backward step. A great deal of this was due to Henry Tudor’s extremely severe methods of high taxation and his suspicious attitude towards his powerful nobles, whether allies or enemies. Some deterioration of lifestyle was also due to foreign wars and politics which influenced trade, and some was due to the start of worsening weather conditions. Britain and Europe’s warm period was coming to an end and the Earth was cooling. Within a few short years the Little Ice Age was starting to form. Poverty and beggary soared, and prostitution increased due to this growing destitution. This was in direct contrast to the gradual improvement in living conditions during the reigns of the Plantagenets, in spite of occasional famines and prolonged storms. At that time the country was slowly becoming prosperous and a burgeoning middle class was expanding. Of course, what your actual business was would determine your way of life. Some jobs involved such noxious practises, (and this in a world where strong natural smells were an accepted part of life) they were banned from carrying out their trades within proximity of other dwellings. Other trades remained a struggle with long hours and little pay, but inflation was virtually non existent, and the cost of living remained generally stable. And the butcher, the baker and the candlestick maker? No trade unions back then of course but the appropriate Guild would protect you, oversee your practises, watch over your apprentices, put on plays at Christmas and generally promote your business. So before the trials of the Tudor dawn, life was improving for most. It was a small world, a cosy world, friendly, chattering and smelly. The population was so very much smaller than today and it was normal for people to be closely acquainted with all their neighbours. This – and the difficulty in getting hold of accurate news – created another of most people’s favourite pastimes – gossip and rumour. The friendly neighbourliness could mean protection, someone to watch the children when you had to work, someone to bring you chicken broth when you were sick, someone to share their oats and parsnips when you lost your job, and even someone to adopt the baby if you suddenly died young. But this also carried its disadvantages – for those same friendly neighbours knew virtually everything you did, commented on it, criticised it, and gossiped far and wide about it. So – the good, the bad, and the ugly!